When a pool is not enough, and just any backyard won’t do, you need an outdoor living space – somewhere you can spend an entire day, entertaining friends and family, serving drinks and meals, watching the game, or drying off in front of a barbeque or stone burning fireplace. 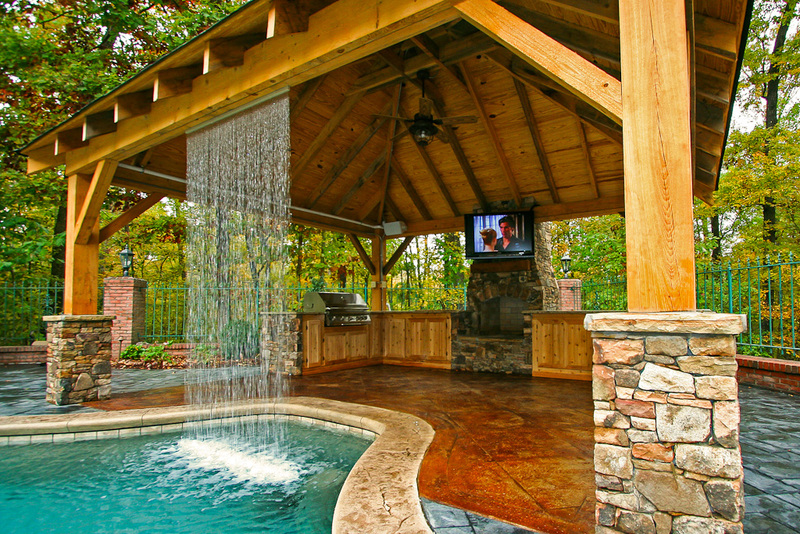 Our outdoor living space designs include anything you can dream up – pergolas, cypress pavilions, waterfalls and fountains, rock formations, custom lighting, and landscaping. And we are a certified dealer of Big Green Eggs and carry several premier lines of outdoor furniture, including Lane Venture, Woodard, O.W. Lee, Lloyd Flanders, Galtech, and Sunbrella. We are your one stop for the perfect outdoor living space. Our outdoor living spaces undergo the same consultation process as our pools – you will receive a custom blueprint and will have as many opportunities as needed to make amendments. If you are looking to spend your nights and weekends entertaining while enjoying the beautiful outdoors, let us construct a custom outdoor kitchen just for you. Our professional designers and builders will construct a fireplace that fits your outdoor needs, from stone fireplaces to ground level or raised level fireplace. Just as each family is different, each of our pools is customized with lots of add-on options. These options include waterfalls, slides, spa spillovers, lighting, and more.